The Little Dipper, a.k.a. 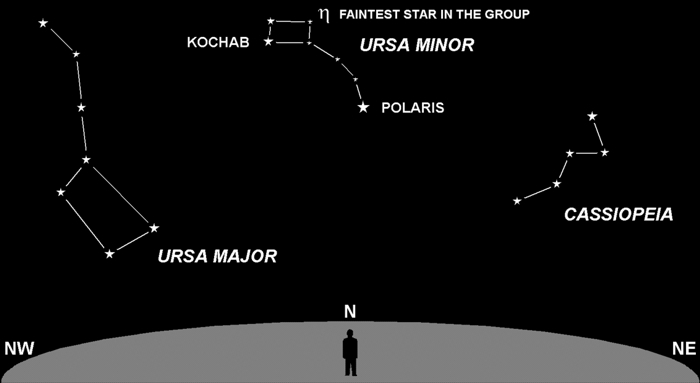 Ursa Minor, is a faint constellation that will test your observation skills. If you can find it at all, you enjoy clearer and darker skies than the average star gazer. This is the best time of year to look for Ursa Minor, now at its highest point in the sky shortly after sunset. Try for it on a clear moonless night. The Little Dipper is anchored to Polaris, the North Star, which serves as the end of its handle. The next brightest star in this constellation is Kochab which marks the top end of its bowl (upside down at this time). The rest of its stars are very faint. If you can see the upper right star (η) at all, you are doing outstanding. Beginning star gazers often mistake the Pleiades star cluster for the Little Dipper, as it does have a dipper-like shape, but the Pleiades is much smaller and rises in the east about 11 pm this time of year.